I had to write and tell you about Morocco’s week-long workshop. She held it Aug 3rd through to the 9th, 2002. It was wonderful. Morocco has a new big spacious studio with hard wood floors and of course that NYC backdrop. It was my first time to the Big City and to Morocco’s studio, so I soaked up as much of the atmosphere as I could. The week began with a concert in Morocco’s studio on Saturday night, which featured guest artists and teachers such as Artemis Mourat, Layali of Zurich, Morocco’s dance company the Casbah Dance Experience, as well as Morocco and Tarik themselves. Sunday morning began with a class taught by Artemis Mourat. 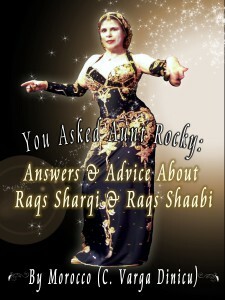 She covered Romany dance while also explaining its rich history and culture. 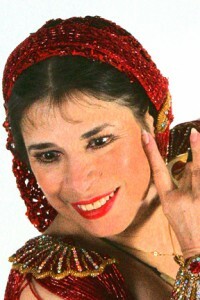 Later that afternoon, Layali taught an oriental routine with an expressional taxim. Monday began the “torture” as Rocky says. 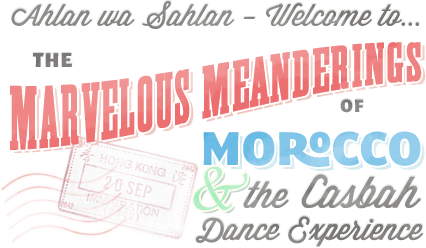 She is truly and expert not only in the field of the dance, but as a seminar organizer as well. Every detail of the week’s events were perfectly structured so that we could focus our full attention of the dance. Her method of repeated segments of the dances being taught not only give you the chance to practice the moves, but to retain the choreography. She taught a handkerchief/ scarf dance to Rachid Taha’s BINT SAHRA, which contained many Algerian Medahat (Algerian Schikatt) elements. Of course she covered the history and culture of the dance with her unique format of story telling. I swear you learn more from her just by listening to her tell these stories. 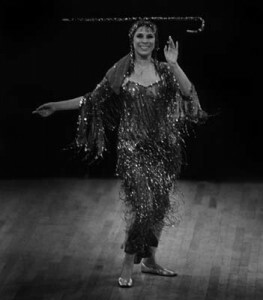 Wednesday she taught to Hakim’s WALA WAHED which is a great Oriental number. Thursday was “Party Time” with Tarik Sultan. Let me tell you, Tarik is a hoot. He started each day with Morocco’s marvelous warmup, in his unique style. Oh God, did my arms hurt afterwards, but I so needed it: stretching and Oriental movement exercises, but he delivered it with his unique style of teaching. He paid particular attention to proper technique and posture, giving personal attention to everyone in the room without slowing the pace of the class. I personally became aware of things that I had forgotten or needed to be reminded of. (Lift that chin up!) This was a nice refresher since I have been dancing for over 20 years and sometimes need those kind of reminders. I had never taken any classes from Tarik before, so I admit I was very curious to understand what his approach to the dance was. Let’s face it, any man that can teach this dance knows his stuff, otherwise he isn’t around for very long. Thanks to his years of intensive studying with Morocco, Tarik is very educated in the dance and very disciplined in the movements. He really knows how to find a dancer’s weaknesses and explain the technique so that they get an understanding of not only the movement, but how the body works as well. He is also very in tune with women and what is important to us as dancers. By the end of Thursday we learned his choreography to a shaabi song by Hassan il Asmar. On Thursday night, the seminar participants had a chance to dance at the Lafayette Grill. Everyone looked so beautiful in their costumes. I saw some fabulous dancing that night. All were rejoicing and so supportive of each other, that it made for a truly magical evening. Friday we had a chance to sleep in and recover from the excitement of the previous night. After a brief warm up Layali, Tarik and Morocco reviewed the dances they taught. The great part, though, was afterwards, when we got a chance to ask questions in a very relaxed informal setting. Both Morocco and Tarik freely shared of their knowledge and insight and culture with the rest of us. My heartfelt thanks go out to Morocco and Tarik for a wonderful week of sharing and learning.